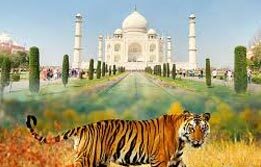 India is undoubtedly the Land of the Maharajas. Here only, a tourist can experience the majesty, opulence and mightiness of a king. Through the Land of the Maharajas Tour, a tourist can experience the regal lifestyle in the royal state of India, Rajasthan. Nothing but the best can be expected out of this magnum opus. From the bastion of democratic power, Delhi; tourists turn towards the mighty Mughal capital, Agra, famous for a teardrop in marble, the authentic Taj Mahal. The next in the series offers a grand Maharaja way to explore India through the many erstwhile kingdoms of Rajasthan including Jaipur, Ranthambore Tiger Reserve, Jodhpur, Ranakpur and Udaipur. 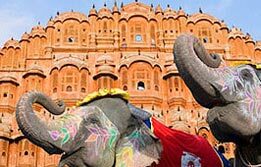 These exemplary cities here offer authentic Rajasthani hospitality, besides a once in a lifetime experience of walking into the heritage palaces, forts and intriguingly colourful markets here. Upon arrival at Delhi airport, meet India Budget Tour representative who will assist the transfers to a prebooked hotel for overnight stay. After breakfast, begin the day with a tour through delights in Delhi. 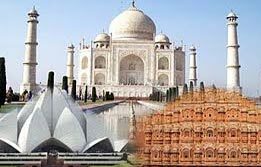 Begin exploring the city via old Delhi tour. Hop inside a rickshaw to have a leisurely excursion through the narrow lanes of the quaint Delhi. Begin exploring the city via a visit to the marvel of old Delhi, Red Fort, the most opulent architectural specimen of Mughal Empire. Stop over at Raj Ghat, the cremation memorial of Mahatma Gandhi. Afternoon, continue the city tour via a drive through Rajpath, the kingside avenue where the India Gate, Rashtrapati Bhawan / Presidential Palace and Parliament are standing in democratic majesty of India. 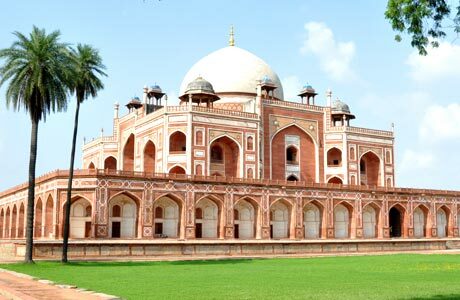 In evening, visit the tomb of second Mughal Emperor Humayun and Qutub Minar, the first Islamic monument in India. Overnight in Delhi. After breakfast, begin a drive to Agra from Delhi (203 Kms / 4 hrs). This Mughal city is the home to the Taj Mahal. Built by a heartbroken emperor, Shah Jahan, in memory of his queen Mumtaz Mahal, it is one of the world's most remarkable and recognizable structures and a piece par excellence. 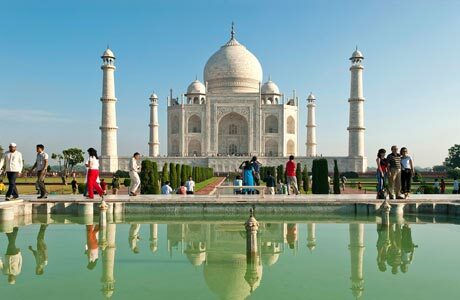 Upon arrival in Agra, check into hotel and begin the tour towards the testimony of Taj Mahal. Later visit the second world heritage site of the city, The Agra Fort and the bazaars of the city are also on today's exploration. Overnight at hotel. (Taj Mahal remains closed on all Fridays). Begin the morning on an exciting note with an excursion towards the city outskirts. 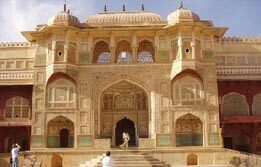 Move from Jaipur towards the Amer / Amber Fort, the former capital of Rajput kings. Here tourists get to step back in time as they begin an enchanting elephant safari, the royal way to ascend the hilltop fort. As they reach the mesmerizing fort, the lavish patios, beautifully decorated pavilions, halls and a spectacular Sheesh Mahal, chamber of mirrors awaits them. 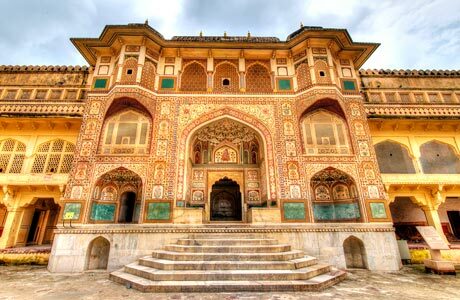 After the excursion to Amber Fort is over, continue the tour through Jaipur including a visit to the City Palace Museum where intricate miniature paintings and traditional Rajasthani royal costumes are displayed in great élan; Jantar Mantar, an 18th century observatory and the landmark of Jaipur, the lovely Palace of Winds built for royal women. Overnight in hotel. Check out Jaipur this morning for a wild excursion towards the fascinating semi arid countryside of Rajasthan in Ranthambore National Park (130 Kms / 2 ½ hrs). this was a legendary hunting ground for the Maharaja of Jaipur. 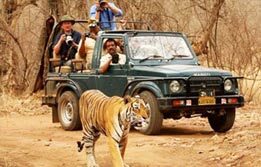 In 1980’s, the wild surrounds of this hunting ground were declared as a national park sheltering the growth of tigers in the region. 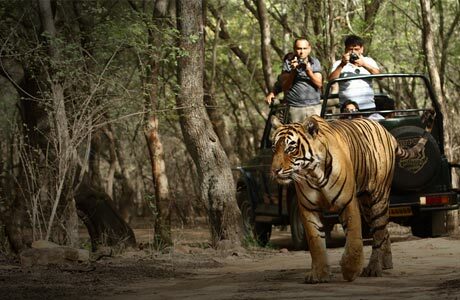 The largest national parks of north India; this is the flourishing home to India's most interesting wildlife species. After check in, proceed for afternoon game-viewing drive. Overnight in hotel. Early morning game drive. This is a perfect time to spot animals during the sunrise. Though the sightings of majestic predator, tiger can be elusive, the valley thrives on numerous elephants and birds of all sorts. Alongside the visit to romantic ruined temples can be enjoyed here. Afternoon is set aside for relaxing. Another game drive scheduled for early this evening when the animals are most active. Overnight in hotel. 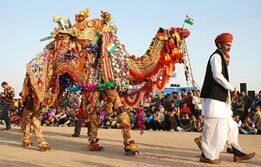 Check out from hotel & leave for the sacred town of Pushkar (245 Kms / 5 hrs). This is a town on the edge of a small lake sacred to Hindus. 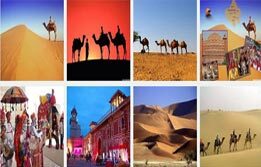 Every November, this small town hosts the world famous camel fair, where nomads and camel traders bring their best stock, more than 25,000 camels at their festooned best to buy, sell and trade the ship of the desert. Upon arrival, check in to hotel for relaxing before leaving for a camel cart ride through the surrounding sand dunes. Visit the only temple in the world dedicated to Lord Brahma, the creator of universe in accordance to Hindu beliefs. Overnight in Pushkar. 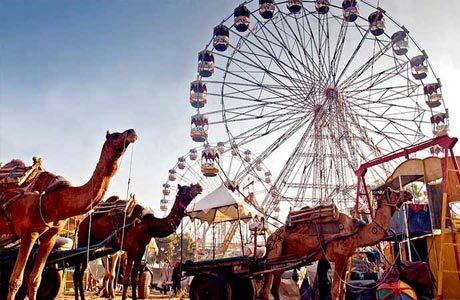 Check out Pushkar and arrive Jodhpur (220 Kms / 5 hrs). Washed in blue, this Marwari kingdom is another desert town of Rajasthan. 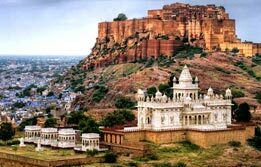 After arrival, discover the city through its magnificent Meherangarh Fort, gazing the city from hilltop in majesty. Accommodating many courtyards and palaces, this fort offers tourists a chance to explore the museums inside the fort complex. Visit the ultimate attraction of the Sun City via a visit to the immensely bestowed Umaid Bhawan Palace and Jaswant Thada, an imposing white marble cenotaph. Evening is free to walk through the jovial bazaars of Jodhpur. Overnight in hotel. After breakfast, head towards Ranakpur, a sight for bestowed and revered Jain temples, (214 Kms / 5 hrs). 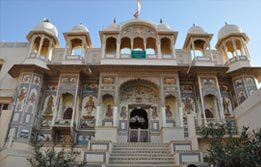 This is one of the biggest and most important marble Jain temples in India. After the sightseeing of Ranakpur is over, begin an excursion towards Udaipur (45 Kms from Ranakpur / 1 hr.). 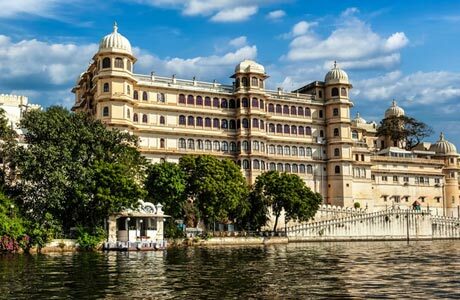 This is undoubtedly the most romantic city in India where palaces and lakes narrate the love tales and provide a scenic backdrop for budding romance. Check in to the hotel and begin exploring the ultimate city of Rajasthan aboard the boat cruise on the serene Lake Pichola. Here the lovely Lake Palace adorns and rules the beautiful landscape of the lake. (Tourists can stay here as a part of deluxe version of the trip). Famed as one of the most beautiful palaces in the world, the luxurious Lake Palace is surrounded by the waters of Lake Pichola and presents itself as a fairy tale fantasy etched in white marble. Overnight in Udaipur. Udaipur is India's "city of dreams" where immaculate specimens of Rajputana and Mughal blend come to life in the City Palace. Inside museum of the palace complex, tourists can marvel at the sight of Mughal paintings and carvings. Visit the Jagdish Temple, where a black stone idol of Lord Vishnu and his vehicle, a mighty bird called Garuda. At Sahelion Ki Bari, tourists can wander through the spectacular garden created as an idyllic spot for queen and her maids. Overnight at hotel. Morning is free for leisure or to discover Udaipur on your own. In afternoon, transfer to airport and board connecting flight for Mumbai. Upon arrival, transfer to hotel. US$ 170 per person, The airfare is current one and subject to change without prior notice. Room on twin sharing basis at each place as per itinerary for total 12 nights. Hotel check in / out 12:00 hrs. Aircon Standard Car (Tata Indigo) for all transfers and sightseeing as per the itinerary only.